WTOP Film Critic Jason Fraley breaks down "Amour," winner of the Palme d'Or winner at the Cannes Film Festival and current Academy Award nominee for Best Picture. WASHINGTON – Last year, the French silent film “The Artist” (2011) won five Oscars, including Best Picture. 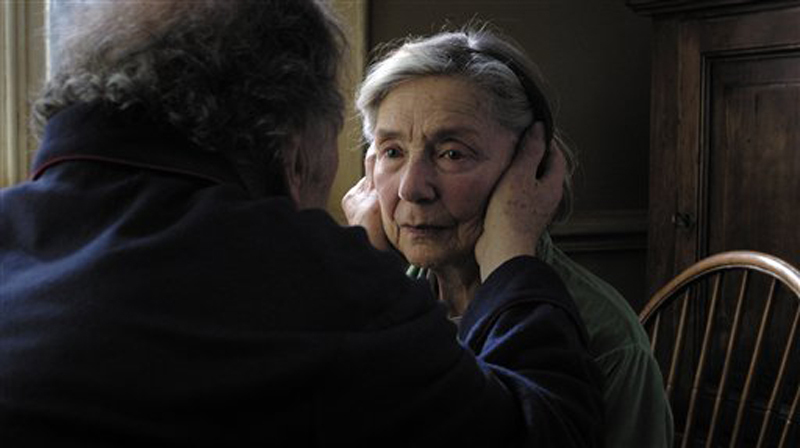 Now, another French filmmaker hopes to do the same with “Amour,” winner of the Cannes Film Festival’s coveted Palme d’Or. The ninth and final Oscar nominee for Best Picture is finally trickling into select theaters in our area. While “On Golden Pond” (1981) starred aging Hollywood legends Henry Fonda (76) and Katharine Hepburn (74), “Amour” jumps to the other side of the pond with aging French legends Jean-Louis Trintignant (82) of Bernardo Bertolucci’s “The Conformist” (1970) and Emmanuelle Riva (85) of Alain Resnais’ “Hiroshima Mon Amour” (1959). After appearing in separate segments of Krzysztof Kieslowski’s “Three Colors Trilogy” (1993-1994), the two now unite for a powerful French-German-Austrian production of love and loss. Writer/director Michael Haneke explores the true meaning of “amour” (French for “love”) through Georges and Anne, an elderly couple of Parisian music teachers, who stare down death after Anne is half-paralyzed by a stroke. Despite their daughter Eva’s (Isabelle Huppert) insistence that they put Anne in a nursing home, Georges stays by her bedside in their Paris apartment until the bitter end. Don’t expect any quick cuts, jarring setups or elaborate camera moves. Haneke’s style isn’t flashy like Guy Ritchie or Quentin Tarantino. He’s calm, collected and cooler than the other side of the pillow. Like his previous films “Cache” (2005), “Funny Games” (2007) and “The White Ribbon” (2009), Haneke’s vision unfolds through a series of long “single takes,” where a static camera rolls without cutting (i.e. Jim Jarmusch) and lingers after the characters have left the room (i.e. Woody Allen). The style is a commentary on our own movie watching, particularly as the camera stares at a recital audience for several minutes. Untrained eyes may grow impatient, but engaged viewers will challenge themselves to a game of “Where’s Waldo?” to spot Georges and Anne in the fourth row, standing to let someone pass to their seat, then applauding the work of their former music student. “Amour” thus transcends the screen like Bergman’s “Persona” (1966), Bunuel’s “Discreet Charm of the Bourgeoisie” (1972) and Allen’s “Purple Rose of Cairo” (1985). It makes us keenly aware of the filmmaking process, just like Georges turning off the soundtrack to highlight the difference between diegetic and non-diegetic sound (sound source visible on screen vs. playing on the soundtrack). The trip to the theater is our only exposure to the outside world, as much of the film is confined to the couple’s apartment, generating a suffocating sense of claustrophobia. This approach not only mimics the characters’ physical lack of mobility, it forces us to watch some very tough end-of-life scenarios. The camera’s unblinking eye watches Anne fall out of bed, defecate in her nightgown, and spin around in a motorized chair, becoming a kindred spirit to a legless Marion Cotillard in my second favorite foreign flick of the year, “Rust & Bone” (2012). At one point, the gazing becomes so intense that Anne says, “Stop peering at me,” but we can’t look away from her anguish. By the end, you’ll want to immediately go back and watch the beginning to see how certain windows got opened, how certain doors got closed, and whether a certain object was present in the bedroom. There’s a reason The Huffington Post declared Haneke “arguably the greatest living filmmaker.” He allows no escape, forcing us to actively engage with his films, rather than passively follow the action. But if you like uniquely emotional films that capture real-life drama with deliberate pacing, subtly mischievous directing and powerhouse performances, put this at the top of your list. Haneke is one of only seven filmmakers to win the Palme d’Or twice, putting him ahead of legends like Billy Wilder, Federico Fellini, Robert Altman and Orson Welles. Granted, Wilder’s “Double Indemnity” (1944) and Welles’ “Citizen Kane” (1941) were banned under Nazi-occupation, a lost period of Hollywood films that French critics revisited in 1945 to coin the phrase “film noir.” These same critics were inspired to become filmmakers themselves in the French New Wave of 1959, which brought brazen techniques back across the Atlantic for the Hollywood Renaissance of the ’60s and ’70s. This American-French exchange has continued to the point where “Amour” is nominated for five Oscars, including Best Picture, Director (Haneke), Actress (Riva), Screenplay (Haneke) and Foreign Film. While it’s a lock for Foreign Film and a solid bet for Actress and Director, its Best Picture chances are far less certain. I’m not sure the Academy will give its top prize to two French movies in a row, especially when “The Artist” (2011) used its silent gimmick to avoid subtitle pushback. The above rating is based on a 4-star scale. Follow WTOP Film Critic Jason Fraley on Twitter @JasonFraleyWTOP or check out his blog The Film Spectrum.